Despite costing only 1.8% of total construction costs, bad waterproofing is responsible for an incredible 83% of building defects requiring remedial rectification work. If left untreated, water penetration into the building structure results in undue moisture in buildings. The presence of moisture can have negative health effects on occupants, destruction of structural elements leading to spalling concrete, weakening of structure & eventually collapse of the whole building. That’s why the OnlineWaterproofingShop – has the best waterproofing & remedial building materials with Australia wide delivery. This unique range of the best waterproofing & building maintenance products have unmatched performance. Provide much needed solutions to common and not so common building maintenance, remedial repairs and waterproofing. Who are they suitable for? That’s right everybody! Architects, Builders, Building Maintenance Professionals, Waterproofers and DIY’s everywhere. Are you looking for solutions for cementitious waterproofing membranes, cementitious waterproofing systems, concrete restoration and corrosion protection, efflorescence removal and bathroom waterproofing. Need a different solution then call or email us. 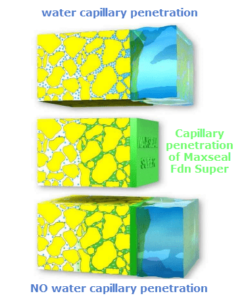 · Excellent adhesion on concrete, brick, tiles, stone, cement mortar, prefabricated block, etc. · No primer or bonding agent is required. Please contact us to make suitable arrangements. Our Team has experienced and solved many waterproofing issues over the last 30 plus years this onlinewaterproofingshop is designed to allow interested parties / customers to improve their knowledge about day-to-day issues involving building maintenance and waterproofing problems that arise in new & older buildings. Intention is to provides access to best waterproofing & remedial building materials which work but people just don’t know they exist. Then allow them to purchase the best waterproofing products & remedial building materials online. Most buildings require waterproofing systems to protect the various areas of the construction from the elements. The maintenance and ongoing protection of building structures involves the selection of the correct of waterproofing membranes and coatings. These waterproofing products protect all the constructional building elements and contents as well structural integrity for the life of the building. Design elements are used to keep the water away building structure, use of waterproofing products with varying degrees of waterproofness, depending on where their intended use eg. paint coatings on external walls usually are only water resistance. Membranes used include acrylic, bituminous, cementitious, clear coatings, and many more. Cementitious waterproofing systems and membranes offer a number of advantages over traditional waterproofing systems. Usually cementitious waterproofing membranes are being applied to concrete or a masonry surfaces so the you using like on like. This means a cementitious coating has the same or very similar characteristics to the base it is being applied to. The concrete or masonry base should be damp and if it’s not damp the substrate base needs to be dampened so that cementitious waterproofing membranes such as Drizoro Maxseal Foundation, Drizoro Maxseal Flex, Drizoro Maxseal Foundation Super White / Grey waterproofing systems can be applied. 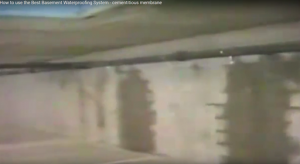 These cementitious waterproofing membranes are simple to apply and can be used on either side of the wall. Traditionally waterproof coatings are applied to the outside (same side as the water will be). Cementitious systems can also be applied to the inside of leaking basements and can withstand hydrostatic pressure generated by the water outside the without delaminating. The last advantage and a very important benefit to the waterproofer is that should a section fail whether by damage by other trades or some kind movement cracking and allowing water penetration into the wall will not cause a Drizoro waterproofing system to delaminate. Where other waterproofing systems when damaged the water penetrates the wall and slowly allows the whole of traditional system to delaminate making a small amount of damage into a total refurbishment at high cost. Cementitious products are used in the maintenance and restoration of concrete and masonry building structures such as concrete spalling (concrete cancer), filling or leveling concrete floors or walls, setting of manhole covers. The most challenging concrete restoration repair was for the Navy: Repairing and sealing of 250 and 400 ton FERRO-CONCRETE BARGES using Maxrest and Maxseal. Repairs had to be completed both on the outside and on inside to prevent sinking as preventative maintenance, to waterproof repairs and eliminate salt water ingress, extending the life cycle of the FERRO-CONCRETE BARGES . 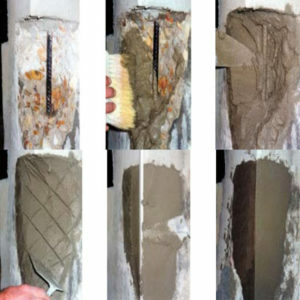 Oxide converters and anti corrosive coatings, such as Drizoro Maxrest Passive, oxide converter and corrosion protection for reo/ re-enforcing bars in structural concrete repair, provide protection of reo/ reinforcing bars, rusted iron, steel found on poorly maintained building structure, especially in aggressive environments eg. close to the ocean where high salt content creates electrolysis which hastens degradation of the concrete and the rusting of the steel. Drizoro Maxrite 700 is a combination of a structural repair mortar, is waterproof, fibred and contains corrosion inhibitors which prevent corrosion by Chlorides and other aggressive corroding agents. Maxrite fibre reinforced, structural repair mortar with rust corrosion inhibitors, specially designed for high performance structural concrete repairs. Most concrete restoration and corrosion protection materials are designed to protect the reo (reinforcement steel) against attack from strong chemical agents-diluted alkali and acid solutions. Products like Drizoro Maxrite 700 also have the added benefit of protecting the concrete structure itself making it more difficult for the corroding agents to reach the reo. Efflorescence is not only unsightly, caused by the presence of water in masonry, and over time causes the degradation, weakening the strength of the masonry, corrosion of the steel reinforcement thus reducing the life of the building structure. Steel reinforcement can expand up to 8 time destroying the concrete structure. Salts and efflorescence removal whether from new or old constructions is essential for the application of any waterproof membrane and to maximize the life cycle of a building. Maintenance of buildings affected by efflorescence, historical and public buildings, walls, floors, masonry, brick, block structures may include treatments to remove efflorescence with clear sealers and other waterproofing products so future maintenance costs are reduced. Construction Joints in new construction need caulking to prevent the water penetration through podium slabs, roofs walls and other penetrations in wall and slabs. The deterioration of control joints from lack of proper building maintenance, poor choice of raw materials in the construction phase, all result in further water penetrations which can destroy the entire waterproofing system once penetrated ie. leaking so it is of high priority that small leaks from gaps between slabs are re-caulked as quickly as possible. Brickwork and mortar lines also need to be re-caulked from time to time to maintain the waterproofness of the waterproofing system. Cementitious expansion joint sealer (15% movement) Drizoro Maxjoint Elastic is ideal for most but if you’re looking for a polyurethane then SEALTUFF- Rapid Cure Polyurethane Joint Sealant to be compatible with a polyurethane membrane eg. a bath room or other wet area. Usually the wettest area in your home are the bathrooms, laundry and kitchens. With brick, masonry block, or concrete walls Drizoro Maxseal Flex waterproofing systems work very well. Specially formulated Industrial Strength, Concentrated Cleaner and Degreaser for industrial, commercial and residential use. Maxseal. MaxPlug & Maxrest to Seals Leaking Basement Wall While Still Wet. For more please Check out our how to do waterproofing solutions page & visit and subscribe to our YouTube channel or and like us on Facebook. Don’t forget this where you get the Best waterproofing & remedial building materials and learn how to use them all in one place. No matter what you are looking for cementitious waterproofing membranes, cementitious waterproofing systems, concrete restoration and corrosion protection, efflorescence removal and bathroom waterproofing if you look carefully through this site you will find it.